On April 22, 1970, 20 million Americans took to the streets, parks, and auditoriums to demonstrate for a healthy, sustainable environment in massive coast-to-coast rallies. Thousands of colleges and universities organized protests against the deterioration of the environment. Groups that had been fighting against oil spills, polluting factories and power plants, raw sewage, toxic dumps, pesticides, freeways, the loss of wilderness, and the extinction of wildlife suddenly realized they shared common values. By the end of that year, the first Earth Day had led to the creation of the United States Environmental Protection Agency and the passage of the Clean Air, Clean Water, and Endangered Species Acts. Every year since, on April 22nd, Earth Day has served as a reminder to treat our planet with care; whether that be through recycling, conservation, or limiting air pollution. Though Earth Day comes but once a year, there are ways that we, as individuals, can contribute to the betterment of our environment and help limit the effects of climate change in our everyday lives. Emissions created by our vehicles through the burning of gasoline highly contribute to the global climate issues we currently face. 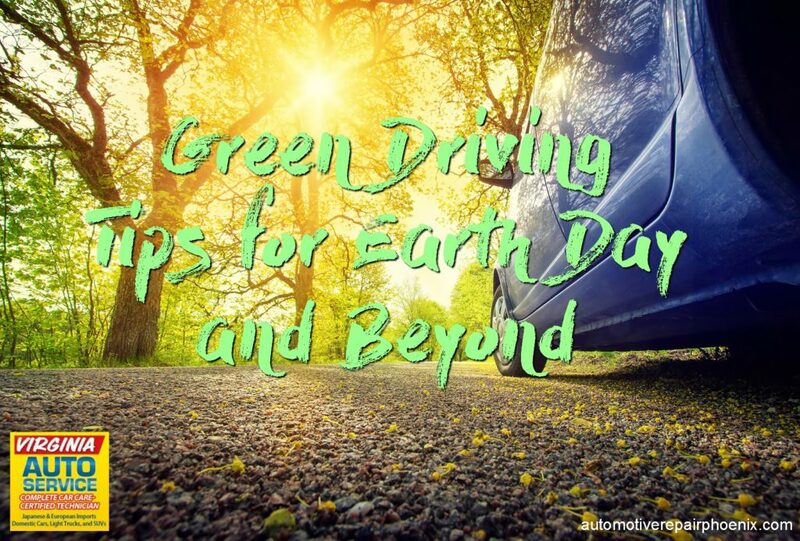 These are some “green” driving tips you can use to help contribute to the Earth Day cause today, and beyond. Perform routine auto maintenance. Regular maintenance helps your vehicle pollute less and burn less gas. With regular tune-ups, you can save as much as four percent on the cost of gas and a clean air filter can improve efficiency by 10 percent. According to the U.S. Department of Energy, fixing a serious maintenance problem, such as a faulty oxygen sensor, can improve mileage by as much as 40 percent. The Car Care Council has also named April “Spring Car Care Month,” making this a great time to have your vehicle inspected for any signs of trouble. Practice conscientious driving. Heavy acceleration and hard braking consumes a large amount of gas. Practice gradual acceleration and braking slowly to not only contribute to a better environment, but safer roads as well. Using cruise control on longer trips or highways can limit the amount of accelerating and braking you do which will preserve gas. Limit AC use. You probably notice you are getting less gas mileage in the summer months, this is because your AC uses a generous amount of gas. When you are driving in the cooler morning and evening hours, try turning off your AC and opening your windows for some fresh air! Though AZ can have some hot weather requiring the use of the AC, there are also plenty of months with beautiful weather in which you can drive AC free. Minimize idling. Even if you aren’t moving, your car is still burning gas. According to fueleconomy.gov , idling can use a quarter to a half gallon of fuel per hour, depending on engine size and air conditioner use. You should turn your car off when you are parked, it will only take about 10 seconds of fuel to restart it. Limit cargo weight. The heavier your vehicle, the more drag you will experience. Drag leads to greater fuel consumption. Apart from your road safety kit and spare tire, try and keep extra things out of your vehicle for everyday driving. Check your tires. The Car Care Council claims that around two billion gallons of gas each year could be saved if the tires on every American’s car were properly inflated. When tires are not properly inflated, it adds rolling resistance, which makes the engine work harder to move the vehicle. Working harder to move uses more fuel and increases the risk of engine damage. The optimal tire pressure for your vehicle can be found in your owner’s manual. Check your gas cap. Around 17 percent of vehicles have damaged, loose, or missing gas caps, resulting in 147 million gallons of gas vaporizing every year. Don’t top off. Topping off your tank when you fill up can release harmful vapors into the environment, and gas could potentially spill onto the ground. It can also cause pressure to build in the tank and flood the carbon filter vapor collection system, which is only meant for vapor. This overflow can affect your car’s performance and could possibly damage the engine. Fill up in the morning. Make the effort to pump gas during cool morning hours to limit your exposure to gas fumes and to avoid fuel evaporation, especially in the summer months. Combine trips. Each time you drive, plan your trip to include more than one errand. Don’t waste gas driving your car two or three times a day when you can organize your time better and accomplish everything with only one trip. Car Pool. It is obvious why you should be practicing this tip. The more people riding together in one vehicle mean that there are less vehicles creating emissions out on the road. Driving technique and proper vehicle maintenance go a long way toward protecting the environment. If you are especially concerned, the next time you are ready to purchase a new vehicle, choose one that is environmentally friendly. The EPA website offers a Green Vehicle Guide to aid consumers committed to reducing their personal footprint. At Virginia Auto Service, we love to help you with your vehicle and safety in any way we can. We hope you find these green driving tips helpful. If you are concerned about your vehicles gas mileage or emissions, don’t hesitate to give us a visit. We are your go-to in Phoenix, AZ for reliable, high-quality auto repair services. Call (602) 266-0200 or schedule an appointment online.